A Character Controller Behavior (beCharacterController) is a Behavior which creates a special Kinematic object in the physics simulation which can be used to perform ground adaptation and obstacles navigation on physicalized entities / Crowd Rigid Bodies. This Behavior relies on the NVidia PhysX Character Controller and only knows about the objects which exists in the physics world. Even if Character Controllers are physicalized kinematic objects, those can not be used to detect Collisions in the Physics Collision Trigger. On the other hand the relative entity can be physicalized using the Physicalize Behavior. As this Behavior can be used to perform Ground Adaptation, it is usually advised to disable the Golaem motion-based automatic ground adaptation, using an Adapt Ground Behavior and set its Adaptation Mode to "No Adaptation". A Character Controller Behavior defines the following specific attributes. For common attributes see Behavior Common Attributes. Step Offset Defines the maximum height of an obstacle which the character can climb. A small value will mean that a Box-shaped Character Controller gets stuck and cannot walk up stairs etc, a value which is too large will mean that the character can climb over unrealistically high obstacles. Volume Growth Scale factor of space around the Controller which will be cached to improve performance. 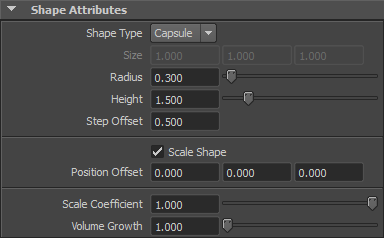 A convenient way to check if the Shape is conveniently sized and placed is to used the Display Collision Shapes option of the Physics Locator. Filter Physics Mode Collisions will not be detected with physics parts that are of the given physics mode (see the Physicalize Mode parameter of the Physicalize Behavior for more information on physics modes). This allows to filter the physics parts which will not be detected. 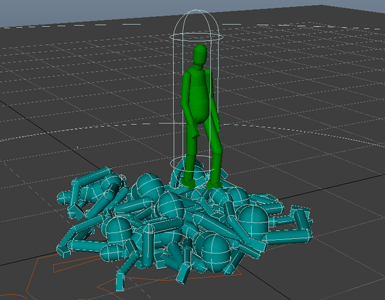 Filter ID Value ID for the filter (to see how to set an ID, check the EntityType , the Crowd Rigid Body and the Physicalize Behavior). Filter Color Value Color for the filter (to see how to set a color, check the EntityType, the Bone Physics Properties part of the Character Maker, and the Crowd Rigid Body). Contact Offset Specifies a skin around the object within which contacts will be generated. Climbing Mode Controls if a Character Controller slides or not on a non-walkable part. This is only used when Slope Limit is non zero. Slope Limit The maximum slope which the character can walk up.